By Nigel Kembrey, 61 Naishcombe Hill, Wick, Bristol, BS30 5QS, U.K.
Left: Fruits of Adonidia merrillii. 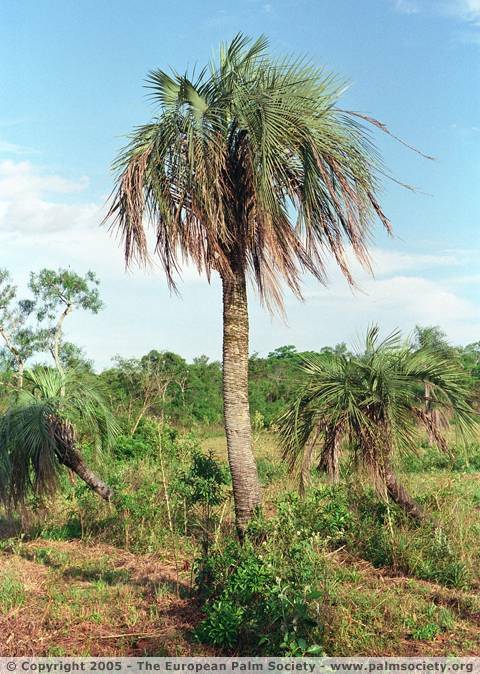 Centre: A colony of Butia paraguayensis in a pasture east of Caaguazu, Paraguay, abt. 350 m a.s.l. Right: Unripe fruit on a cultivated Hyophorbe lagenicaulis, Homestead, Florida, USA. Butia species have something of a reputation of being an impossible seed to germinate. I must admit to trying and failing many times over the years and came to the conclusion their best use was as ammunition in my sons peashooter. However, having become somewhat bewitched by the genus, I decided that I had to find a way to defeat one of natures enigmas once and for all. I began by building a custom-made germination unit. This is basically a box made from polystyrene sheets. These sheets are used in the building industry as insulation to go between the two skins of a wall and are available at any builders merchant. I lined this polystyrene box with a soil warming cable and added a thermostat. My initial tests were with fresh seed of Butia capitata and eriospatha. I made up a mix of 75% perlite and 25% vermiculite, soaked in water and allowed to drain. I then filled a plastic tub, semi buried the seed (which had been pre-soaked) on top of the mix and sealed with a lid. I had 75% germination within 6 weeks at a constant 30°C. I tend to allow the seedling to develop in the perlite until the leaf is visible, and then lift it out and pot it up. This gives the best survival ratio. Adopting the same method I achieved a very poor germination rate and after 6 months had only a handful of seedlings. I was puzzled by this, but decided that it could not be coincidence that it was only the more southerly species that were not germinating and decided to fluctuate temperatures to simulate the day/night cycle. As the more southerly species are subject to greater variation in seasons, longer dry periods and winter cold, it seems logical that the seed will have an inbuilt switch that decides the optimum time to germinate for survival. I re-soaked the seed and changed the temperature regime: 20°C overnight, 30°C at 9am, 40°C at 1pm, and back to 20°C at 6pm. Within one month, of the remaining seed, from 50% to almost 100% with some species was in the process of germination. I have read many times of tales of cracking Butia seed to achieve germination. Hopefully my method should help prevent this necessity. However, I myself have tried cracking old stubborn ungerminated seed, and found that if soaked in Nitrozyme (a natural gibberellin) then 100% germination will occur within days. 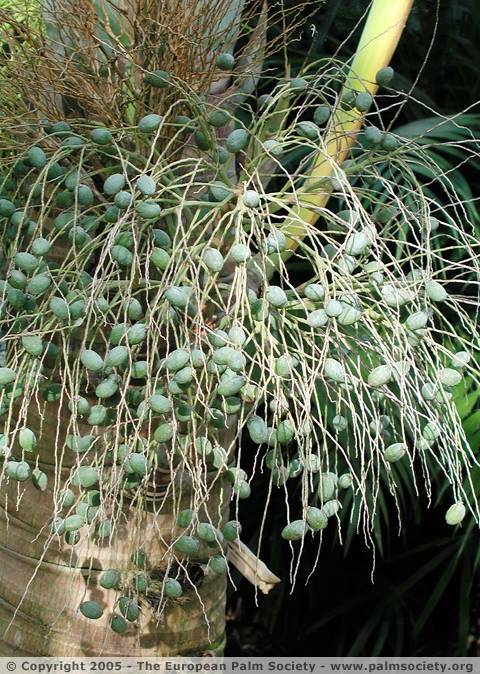 However, once cracked, the seed is vulnerable to rot, and if the seed succumbs to rot before completing the initial seedling leaf the seedling stalls and dies. The above method works well for Syagrus species also. Jubaea also responds well and fresh seed will give 100% germination within weeks, although the temperature range with Jubaea needs to be between 20°C and 30°C. 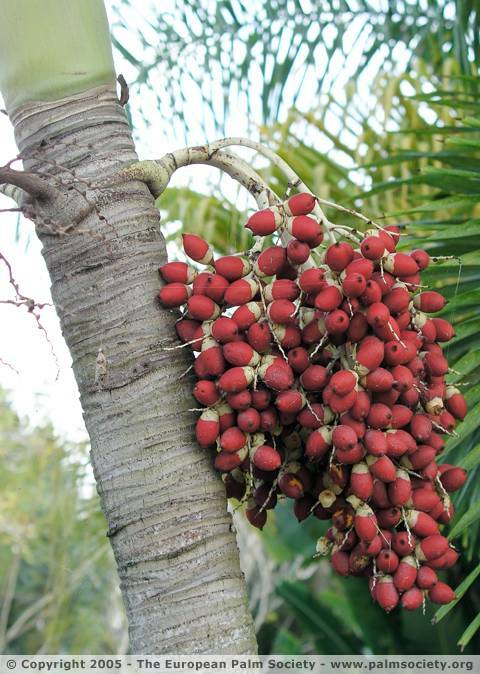 I have just ordered a new batch of Butia archeri seed from RPS. This is one of the last Butia to elude me, and hopefully by the time you read this article I will have seedlings well on the way.